Yard shrubs in Tree, Plant and Wood I.D. I've got a couple shrubs in my yard that have borne a lot of fruit this year. Can't remember what either one are called though. First one is choke cherry. Very very sour. Did I say sour? We just picked about 20 pounds for jam making.I use to have alot of choke chery bushes around every rock and along the road. Pulling them out with a chain and round up did them in. Than I met my wife and she makes jam out of them. So we have to go found some at other places. They seem to like stone walls the best. There is such a thing that is called books. I have a good tree book,and bought a good shrub book last year. I am ready for old age now!!!! Yes, the chokecherry and cranberry are turning already. Have seen some large alternate leaf dogwood here flower in the spring. The bushes get big. Soon be making jelly, if so inclined. Hoping to have some Concorde grape from my old vines, but that depends on whether the fungus gets them first or even the chipmunks. Found a native wild grape in the back yard this summer, never seen them here away from the river before. Birds. 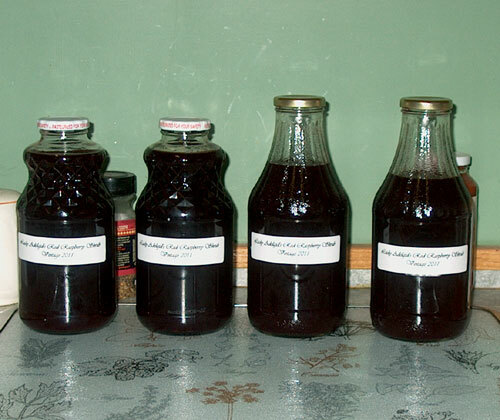 Might get a handful of black elder to mix with some raspberry for a vinegar drink (shrub). Started by Dodgy Loner on Tree, Plant and Wood I.D. Started by SwampDonkey on Tree, Plant and Wood I.D. Fertilize soft mast trees and shrubs? Page created in 1.047 seconds with 39 queries.